Just like most pure breeds, the Pug dog breed is susceptible to some health issues. While most of these are easy to correct and not life threatening, there is one condition called Pug Dog Encephalitis that can be deadly. Pug Dog Encephalitis or PDE is a condition that causes inflammation of the brain. This can cause your Pug to walk funny, seem lethargical and have seizures. Unfortunatley, there is no cure for this condition and it is often fatal. PDE can progress rapidly or slowly and for the slower progressions, there is medication that can help control seizures and give your Pug quality of life. While PDE can be devastating for Pugs and their owners, please bear in mind that only a small percentage of Pugs will be affected by this condition. Luxating Patella - Sometimes called "trick knee" this is a small bone that gets dislocated in the knee. Sometimes it goes back in on it's own, or your vet can pop it back in. In severe cases, surgery can correct it but in most cases the Pug lives fine without any surgery. Elongated Soft Palette - As with most dogs that have a short snout, one problem of the Pug dog breed is called Elongated Soft Palette. The soft palette is a flap of skin that closes off the airway during eating. When it is elongated, it can affect breathing and if you notice your Pug gasping for air, honking or snoring then this could be the cause. This can be treated surgically. Dry Eye - Dry Eye Syndrome or Keratoconjunctivitis Sicca is a bit more serious and can cause blindness in your Pug. It is caused by an in crease in tear production and the first signs are a lot of mucus discharge from the eye and conjunctivitis or inflammation around the eye. If you notice this in your Pug, take him to the vet as this condition can be treated with drugs and surgery. Tracheal Collapse - Common in many small breeds, tracheal collapse is caused by a softening of the cartilage in the trachea. This narrows your dogs windpipe and you might notice gagging or honking. If you do notice these symptoms in your pet, get him to the vet as this problem is very serious but can be treated with therapy and if very severe with surgery. 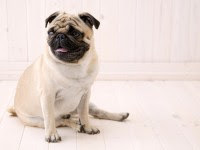 Just like any other breed, the Pug dog breed has it's share of common health problems. However, for the most part, they are a healthy breed and make a wonderful and fun companion for any family. I really enjoy blogging and I would love to follow and make friends with similar bloggers! .